Shouts are the best way for you to tweak your tactic on the fly whether or not you use a custom tactic or not. 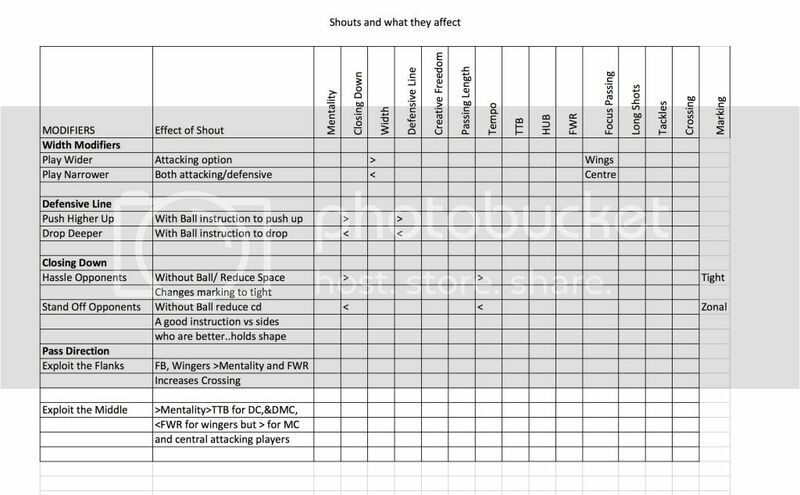 Understanding what shout effects which slider is the key if you a custom tactic builder. 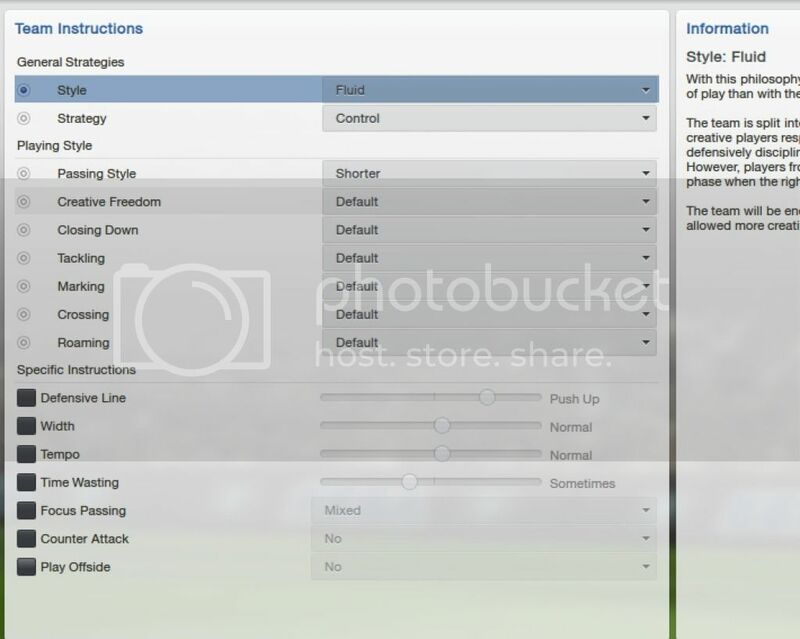 For people who customize their tactics like me they wont find it useful unless, you use the tactical creator and then ADJUST individual settings, when you do that you can still use the shouts. But, you need to know exactly what they affect. Theres no point using a customized mentality setting and then go use the Exploit the Flanks shout. Your mentality settings wont change. And this is where Shouts come into play. Shouts allow the person who uses the tactical creator to get the best out of his system. Its his way of tweaking the tactics on the fly. We were tweaking tactics manually before 2009, but now SI have included tactical presets in the form of the tactical creator which allow you to choose a mentality system whether its a global one where everyone is on the same mentality (Very Fluid) or where we have 3 distinct groups of mentality (Rigid) and a whole series of mentality systems that fall somewhere in between with the rest. While some may want to fine tune the mentality systems like me, its important to realize that you can get the best out of the shouts if you know which sliders they affect. I for one usually use a few shouts in game even with my customized setup. The three shouts listed below are probably very commonly used, but I will need to incorporate Philosophy and Strategy into this thread, cos they all affect what happens in a game. Nothing can be discussed in isolation. This thread comes from all the frustration I feel reading threads in the bugs forum where people cite the engine for failing to provide players who run across the D-line or play that elegant through ball.. its possible. I have a very strong feeling that whilst a lot of older players more used to sliders have become adept, a newer group of players who come on using the TC may not understand the interplay between sliders, shouts, and such. 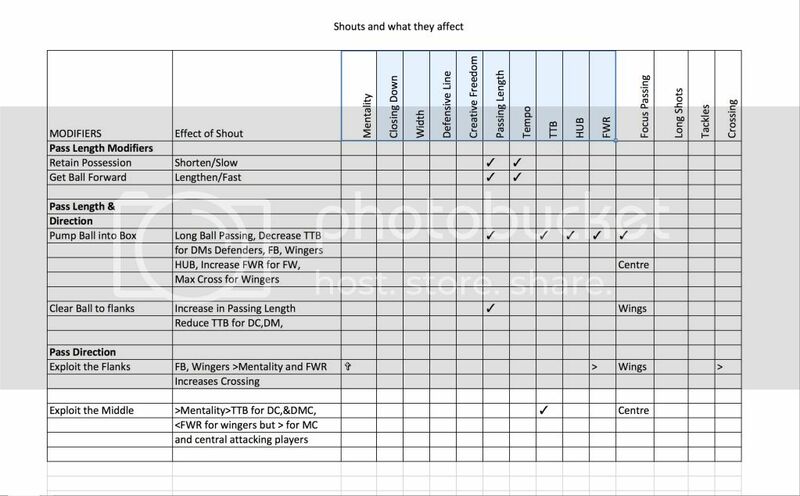 These shouts(the ones below) I use more commonly, cos I do use the tactical creator, but i adjust the mentality sliders to suit my style of play. I leave everything on loose zonal cos i find that in games where i need to impose tactical discipline these shouts actually come in very handy. In a lot of games you will find yourself either stuck on a narrow pitch or you could end up facing someone whos determined to play through the middle. In such a case I use Opposition Instructions to shut down their most influential passer of the ball in midfield and then switch to wider. I also turn on hassle opponents, but this needs to be done with caution. It affects tight marking and closing down. If you are faced with a technical superior side this instruction can actually work against you cos you are closing down more. It works well on narrow pitches, but on wide pitches its really counter productive. 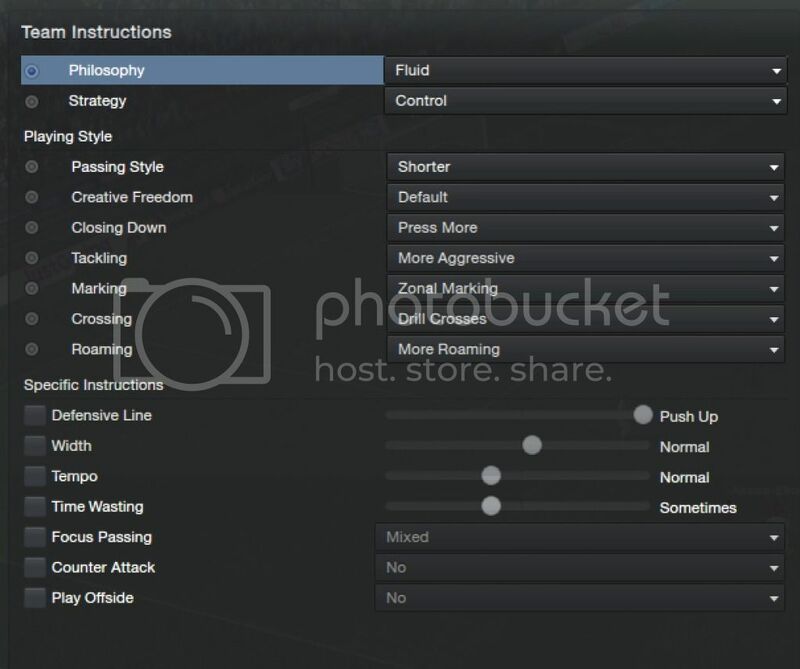 Its far better using individual settings to shut down players or tight mark them. In this case i usually just ignore hassle opponents and since i like to play with 2 teams of players..ie defensive/attacking. I set up tight marking on the attacking group and set them up..cos AMLs with TM the opposing FB. On paper, you hear commentators remarking how players should do whats below. The reality is much harder. Even in the game its much harder to get it off. It requires a great deal of stamina and determination. If you have neither in high quantity, be prepared for winded players. The look for overlap instruction will set players off down the flanks. It works by getting midfielders to hold up ball to make room for the FBs. Now whilst this looks ideal, players need good otb and good decisions as well as passing. There are other shouts I havent listed which come in very handy when you want to do this and they include the Work into Box instruction. 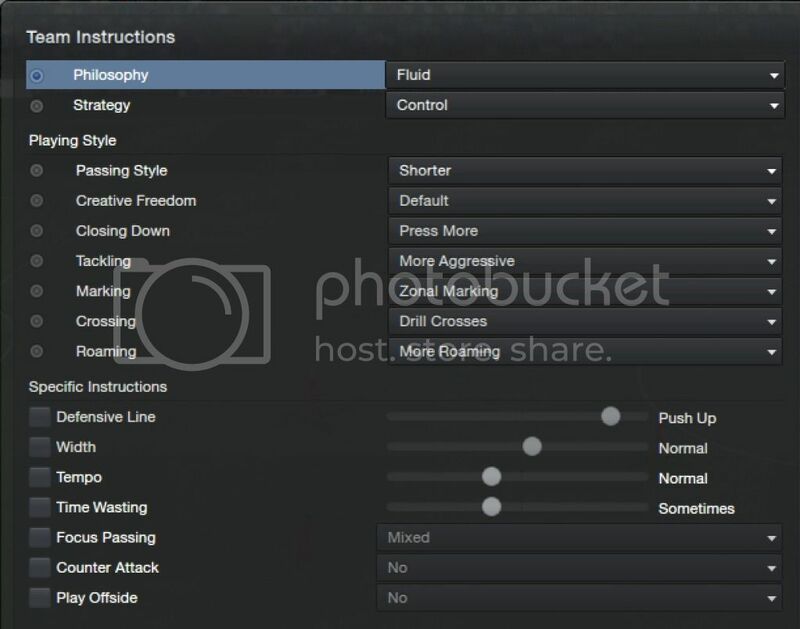 Setting your wingers to roam out of position, coupled with higher Creative Freedom which you can customize, you can actually create effective inside forwards for your FBs to exploit. I usually like to to see FBs come up the pitch and inside forwards pick up the ball and run inside to give the FB unmarked space to exploit. Setting roam, plus FWR does that for them. So whilst the overlap shout is good, you can make it better by customizing the creative freedom and roam instructions. Whats interesting is how shouts can drastically alter your game plan. It aint half bad most of its set on default and normal..and if you look at the mentality settings “control”, and you look at how the mentalities are spread “fluid” you reckon its pretty balanced. Tbh its a pretty safe way to start, yeah my mentalities are a bit different cos i want one full back to be more attacking orientated. Now when you get to the team settings page you can always do minor things eh? You can make em drill crosses, ah there is also an instruction to press more. Who doesnt want to press more? All things being equal we all love that extra press dont we, and you hear it on the telly that the players should press more. So you choose to make some modifications which would be natural..So you add the pressing instruction and you tell em to drill crosses and you choose to get your players to be a bit more aggressive. Now by doing that little press more instruction your defensive line just went up a few notches..chances are a lot of people would have missed that. Now you start the game and you decide, hmm I want to play retain possession and make sure i play in their half..( at least thats what they all say they do on the telly and you decide to make two shouts: RETAIN POSSESSION and PUSH HIGHER. Now look at your defensive line.. Here is where a lot of people seem to have problems, its understanding how the wanton use of shouts can unbalance a tactic. Even if you were to take a standard tactic, failing to understand how shouts can move things around can make you lose out. This is useful, I’d like to have the chance to enlarge those excel tables, I hardly can read them as they are.